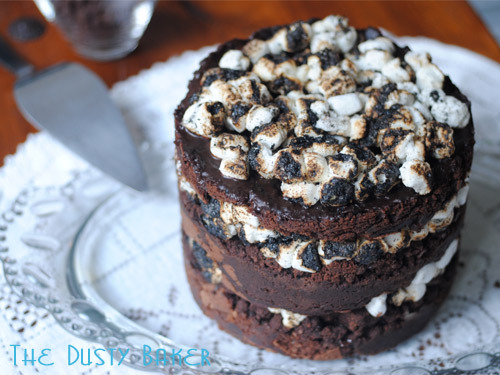 Chocolate Mallow Layer Cake – Gluten-Free for Milk Bar Mondays! I interview chefs weekly for Serious Eats, a national website that covers restaurants, bars, recipes and events. Lately the subject of diminishing pastry chefs and departments has come up a bit, most prominently with Lauren Resler, a pastry chef I adore who turns out layered, whimsical desserts for her restaurants, Empellon Taqueria and Empellon Cocina here in NYC (if you haven’t been – go!). I’ve questioned many a pastry chef as to who they think the next “it” chef of their generation would be; a Michael Laiskonis, Johnny Iuzzini or Alex Stupak on the rise. Many of the chefs I’ve asked say something simple needs to be done: someone needs to focus on reinventing classics with a deeply personal twist, something old but incredibly new as well. As I adapted Christina Tosi’s Chocolate Malt Layer Cake into a version us gluten-free eaters can enjoy, I realized that Tosi may just be that chef. Granted I’ve never eaten one of her desserts, as they’re all loaded with gluten and dairy. But as the Milk Bar Mondays ladies and I have baked our way through her cookbook, I see that she’s doing exactly what we want someone to be doing: elevating classics into something so over the top that, like pastry chef Stephen Collucci said when trying her Cereal Milk Ice Cream, “it’s so good it’s stupid”. This cake is so good it’s stupid. And it probably would be more banging with the original malted layer that I had to stray from, as “malt” might as well mean “barley” which might as well spell out “gluten”. 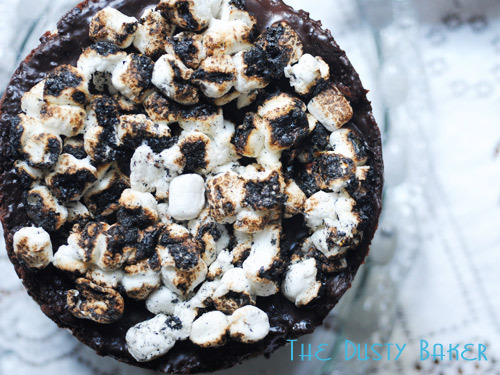 I tweaked a bit here and there, but kept as true to the recipe as I could: a fudgey chocolate cake layered with a soak of milk, some crunchy chocolate cake crumb clusters, the chew of charred mini marshmallows and a drenching of chocolate fudge. Yeah. That happened in my kitchen. This is chocolate overload, and there was no time better than the ooey-gooiest week of the year last week to go overboard. I had to give the majority of the cake away because I love chocolate but couldn’t handle too much of this without going into complete sugar and caffeine shock. Actually, I’ve rebooted my eating habits completely for Lent and this was the last splurge of the season. It’s totally worth it. Now, this cake involves a lot of steps. But it’s not a hard cake. Basically it involves making homemade chocolate fudge sauce, charring some mini marshmallows, infusing some milk with vanilla, baking some really quick chocolate cake crumbs, and whipping up a chocolate cake. It’s worth it. Promise. My messily adapted recipe is below. Head to Erin at Big Fat Baker for the full malty-yum-yum version, and to Audra at The Baker Chick for her gorgeous version and thoughts! For this you’ll need a 6″ cake ring, a pan lined with parchment or silpat, and 2 strips of acetate cut 20 inches long and 3 inches tall (alternatively, line some thick drawing paper with parchment and cut to fit ring 6″ high). Have a silpat or parchment lined sheet ready. Use the cake ring to carefully cut two circles in the cooled chocolate cake. Place the cake ring on the sheet and insert one of the rings of acetate. Make a layer of cake with all the scraps left around the circles, using the back of your hand to tap down. Give the layer a good soak of vanilla milk. Then give it a good swirl of chocolate fudge sauce, smoothing out with the back of a spoon. Cover with 1/2 of the chocolate crumb and press down to make even. Then layer 1/3 of the marshmallows, as evenly as possible. Give another swirl of chocolate fudge sauce. Gently set one of the cake circles on top and slightly press down to seal. Slip the second acetate ring on top, tucking around the cake layer. Repeat with layers of milk, fudge sauce, crumb, mallows and more fudge sauce, then slip the top layer of cake on evenly. 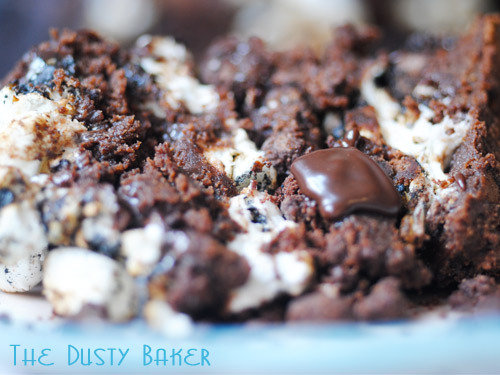 Pour remaining fudge sauce on top and layer with remaining marshmallows. Freeze at least 12 hours before serving. 3 hours before serving, remove ring and allow to defrost in refrigerator for 3 hours. Place chocolate, cocoa powder and salt in a medium bowl. Place corn syrup, sugar and coconut milk in a small pot over high heat and whisk quickly to combine. Heat until it boils, then pour over the chocolate and let sit for one minute. Slowly start whisking the chocolate mixture (very slowly!) until it starts to incorporate. Increase speed every 30 seconds or so and whisk until the mixture is smooth and glossy and no bumps from chocolate or cocoa are seen, around 4 minutes. Pour into measuring cup and cover in plastic wrap. Scrape vanilla pearls from bean with the back of a knife, then slice bean lengthwise in half. Heat milk in microwave for 1 minute, then add vanilla beans and pods. Let infuse and cool while you prepare the rest of the layers. Heat oven to 300°. Line a sheet plan with parchment or Silpat. Place dry ingredients in bowl of standing mixer with paddle attachment and paddle to whisk together. Slowly stream in melted butter and whisk until small clumps form. Pour onto baking sheet and bake for 20 minutes, occasionally breaking up crumbs with spatula. 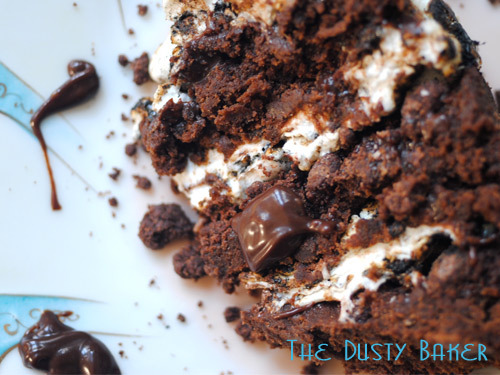 Spread the mallows out on a dry baking sheet. Torch until they’re completely black and crinkly on top. Place pan in fridge or freezer for 10 minutes to cool again. Now, a blow torch is such a fun and easy little tool for the kitchen, I totally recommend getting one (they’re not expensive and you’ll find ways to use them). If you don’t have one, just stick this sheet pan under the broiler or use one of those long-necked lighters to light the mallows. Heat oven to 350°. Line a quarter sheet pan (a small one!) with Silpat or parchment. In a bowl of a standing mixer with the paddle attachment, paddle butter and sugar on medium/high speed for 3 minutes. Scrape down sides, add eggs, and beat for another 3 minutes. Scrape again. In a small bowl, whisk together milk, yogurt, oil and vanilla. Add to mixer and beat on high speed for 5 minutes, until the mixture is light and fluffy. While that’s beating, whisk dry ingredients together in a small bowl. When ready, add to mixer on low speed and mix until just incorporated. Scrape sides of the bowl and mix again until all clumps of flour and cocoa are gone. Spread evenly in prepared pan and bake for 30 minutes, or until the edges of the cake are set and the middle is no longer jiggly. Cool completely before inverting and cutting into. This is a very fudgey cake, so handle with care! Learning this really quick fudge sauce was the best thing about this recipe for me, and that torched marshmallows are really just the best way to make anything chocolatey better. WAY excited by what we learned with this one! Blimey… that’s… massive. Like :D – seriously looks deadly, which all the best cakes do! That is one seriously delicious looking cake! this looks incredible. i need this!